The all CHINO business, Technology and Experience. CHINO research and develops high sensetive and precise thermal imaging camera based on Made in Japan technology with great 80 year experience in the field of non contact temperature measurement and thermography. CPA-R, TP-L and TP-S thermal imaging camera playing vital role at industry in all over India and providing excellent solution for ultra-high temperature monitoring and moving object real time temperature measurement. TP Series especially 6Hz for small thermal imaging camera. An additional analog output available now. This compact thermal imaging camera has 2000 pixel of infrared detecting element. It is versatile and installed type thermal imaging camera. 6Hz analog output is added area data such as temperature change trend monitoring of various line. You can use this TP Series of thermal imaging camera in various field of utilize according to your application. Furnace Temperature Monitoring System. 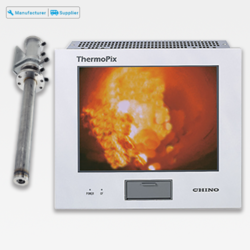 The relay lens type internal temperature monitoring camera that converts Near-Infrared light caught by relay lens into two dimensional color temperature image with a controller by visualizing it with a CCD camera and camera unit uses a thin tubular relay lens just listen to the small hole in furnace wall can be inserted and can monitor the situation inside the furnace in a wide angle view. the console roller is equipped with a touch panel type liquid crystal monitor has various analysis function. Radiation thermometer with thermal image. TPS is a radiation thermometer with thermal image. Suitable for routine equipment inspection, carrying one person. With conventional spot temperature measurement, it took time to discover heat generation and cooling section in equipment diagnostic and maintenance application. 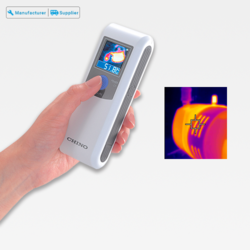 By using easy thermo TP-S the thermal image around the temperature spot is display at the same time and it is easy to visually identify the abnormal heat generation part with high speed.